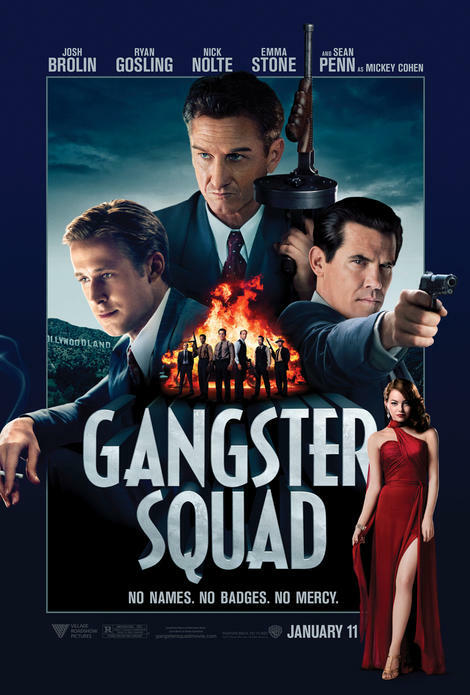 Gangster Squad a movie for people who care nothing for good cinema or history. It has all the subtlety of Dragnet and is so stiff necked it is laughable. Mostly it feels like a Gung Ho ‘True Detective’ pulp story, but has none of the flair or humour that usually accompanies this kind of thing. One only has to look back at ‘LA Confidential’ for the kind of movie it could have been and see by how much Gangster Squad falls short. Does no one read Raymond Chandler anymore for God’s sake? Josh Brolin as Sergeant O’Mara is so darn heroic and tough; he’s bound to have an embolism before the movie is halfway through. Ryan Gosling thinks he’s in a 70’s Burt Reynolds movie and Emma Stone tries to vamp, but has none of the flawed vulnerability that Kim Basinger brought to her role in 'LA Confidential' that would make us feel anything for her. Sean Penn chews the scenery (which by the way shakes when he sets fire to the hotel corridor. Can’t they screw the sets down a little better?) He looks ill most of the time and where is the charm he was known for that garnered him the influence he wanted in LA? It doesn't quite gel with the OTT maniac we see here. The plot to destroy Mickey Cohen – major LA Gangster is a true story. Whether it was done in this way – with such extreme violence – off the books – is debateable. Either way it makes the bad guys into Keystone Villains and the good guys into psycho puppets. Just because you can make a movie look like it is set in 1949 – doesn’t mean the actors live like they were there, or indeed had any interest in it. I guess Robert Patrick as the old-timer gunslinger Max Kennard is the closest you get to someone who gets into a character, but it doesn’t sweat the period and seems no one listens to the radio, and where are the Bob Mitcham’s and Sinatra’s who were all pals of Mickey Cohen? How come they aren’t there? Nick Nolte (born in 1941) is almost old enough to remember what it was like, but way too old for Chief Parker. Nice to know he’s still alive though. Rent ‘Chinatown’ to get the real feel for LA and corruption. Gangster Squad is forgettable and regrettable. © Hackwriters 1999-2013 all rights reserved - all comments are the writers' own responsibility - no liability accepted by hackwriters.com or affiliates.